Nothing like whipping up a high protein low carb meal for 4 in less than half and hour. Perfect for a busy household. Combine teriyaki sauce, garlic and pepper in a large ziplock bag. Add steak, seal and turn several times to coat with marinade. Let stand 15 minutes at room temperature. 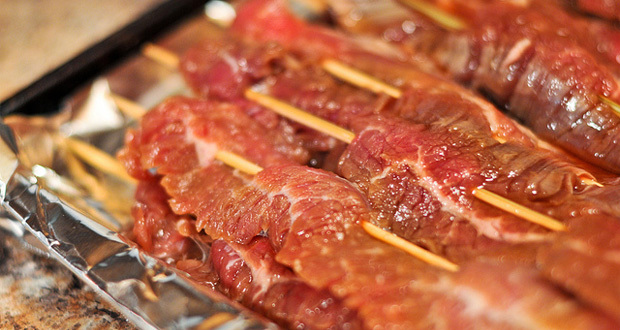 Thread meat onto thin metal skewers; oil grates. Grill steak, turning once, until cooked to desired doneness (1 to 2 minutes per side for medium-rare). Transfer skewers to a serving platter, sprinkle with scallions and sesame seeds and serve.